What is a Pay Period? How are Pay Periods Determined? A common question that we hear from new business owners is “what type of Pay Period should I use to pay my employees?” Employers who have a history of business generally know what works for them, however, if you are a new business owner there are some important questions to ask yourself. This article will explain the four types of Pay Periods and provide examples of the advantages and disadvantages of each type. OnTheClock defines a Pay Period as a recurring time schedule that determines how often your employees will be paid. Having an established payroll cycle is critical for your business to operate correctly. It ensures that your employees will be paid on a regular basis for their labor and it simplifies monthly reporting requirements for employer liabilities such as expense accruals, tax deposits, and insurances. There are four types of pay periods and each pay period has its advantages and disadvantages. A weekly pay period consists of 52 total 1-week pay periods. For a full-time employee, each pay period generally consists of a 40-hour work week. State Overtime Rules vary greatly based on which state you conduct business. Weekly is the preferred pay period cycle for most trade (hourly) workers because they are paid on a weekly basis and this helps with cash flow and budgeting. However, from a payroll perspective, this is the most expensive to process because there are 52 payroll cycles in the year and payroll fees can add up quickly. Payday generally occurs on a Friday, 4-5 days after the period has been closed out. Employer monthly accrual expense reporting can be more involved because pay periods can often extend into the next month requiring additional calculation. A bi-weekly (2-week/14 day) pay period consists of 26 pay periods in a year. Each pay cycle generally consists of 80-hours for a full-time employee. Like the weekly pay period, a bi-weekly pay period will always begin and end on the known day of the week (for example, start on Monday and end on Sunday two weeks later). The employer will generally deliver payroll checks to the employee on the following Friday. Bi-weekly is common for both salaried and hourly employees. A semi-monthly pay period has 24, pay periods in a year. Each month will always have exactly two work periods, consisting of roughly 86 hours each. Generally, a company may have a pay period that runs from the 1-15th and the second pay period from the 16th-last day of the month. Because this pay cycle does not always end on the same day of the week, it can create scheduling challenges for payroll. The employee will get paid on the next possible business day after the work period ends. Employee gets paid often (24 pay cycles). Employee hours worked will always remain in the month for that work period(s). This may simplify employer accrual expense reporting requirements and reduce costs. Payroll processing fees are generally lower due to less frequent payroll cycles. Employer will have to decide when the employee will be paid. Because this type of pay period always ends on a different day of the week, it can be a challenge to schedule and cut checks in a timely manner. A monthly pay period consists of exactly 12 pay periods per year. Each month will represent the total hours for that month. This is the least costly from a payroll perspective, however, it can be a challenge for employees to only get paid once a month and budget accordingly. We have found that many consultants or freelance professionals who invoice their customers monthly use this method to track their hours. In this case, the freelance person may simply be using the pay cycle to determine the hours to bill that client for the month. Great for freelance type business owners or contract type employee who invoice once a month (12 pay cycles). Employee hours worked will always remain in the month for that work period. This may simplify employer accrual expense reporting requirements and reduce costs. Payroll processing fees are very low due to less infrequent payroll cycles. What type of pay period should I use? It is difficult for to tell what is the best pay period for your type of business. Much of this depends on if your employees are hourly or salaried, the type of business you operate and who handles your payroll. Our general advice is to check with your accountant or CPA and see what they think is best for you. What is the most common pay period type? We ran the numbers and we have a winner! We surveyed employers who actively use OnTheClock and the Weekly Pay Period is by far the most popular. Followed by Bi-Weekly in a close second place position. 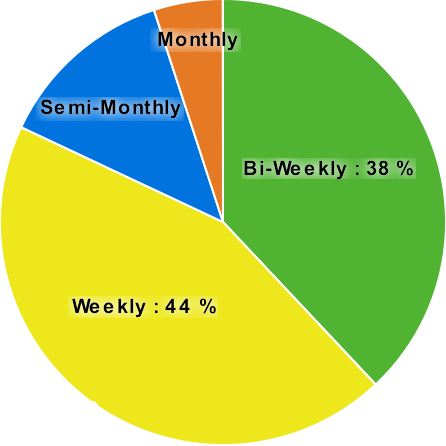 44% of our customer base uses a Weekly Pay Period. 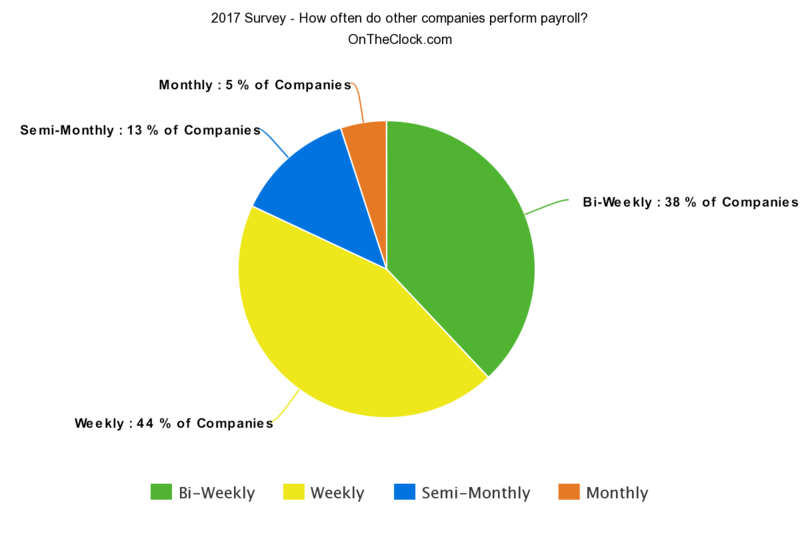 38% of our customer base uses a Bi-Weekly Pay Period. 13% of our customer base uses a Semi-Monthly Pay Period. 5% of our customer base uses a Monthly Pay Period. This will be my first job so I'm curious about this. The job that will be interviewing me pays weekly every friday. Does that mean when I get hired I'll be paid next week? If a pay period starts in one year but ends, and ultimately pays out, in another year; eg Dec 24th 2018 Dec 30th 2018; does the first weeks pay count towards the second year's taxes or the year it was worked in? Does it matter the year the date the the money was actually paid? Is it possible for you to give me a link to reference for this specific question (Via NYS or federal) ? reply from OTC - Hello Telk, Thank you for the question. As we told Justin in a previous comment, it is our understanding that this particular situation would fall under your 2019 taxes since the wages would be paid and collected in 2019, although some of the work was performed in 2018. We recommend checking with your accountant and/or employer for further details, but we hopes this helps. If a pay period starts in one year but ends, and ultimately pays out, in another year; eg Dec 24th-Jan 6; does the first weeks pay count towards the second year's taxes or the year it was worked in? I have a question. This is for a weekly paid employee. If the company you are working for changes the vacation scheme from paying you your 8% when you take vacation to giving the 8% vacation pay on every pay cheque, are you going to have less vacation pay in the end. Or is it the same.